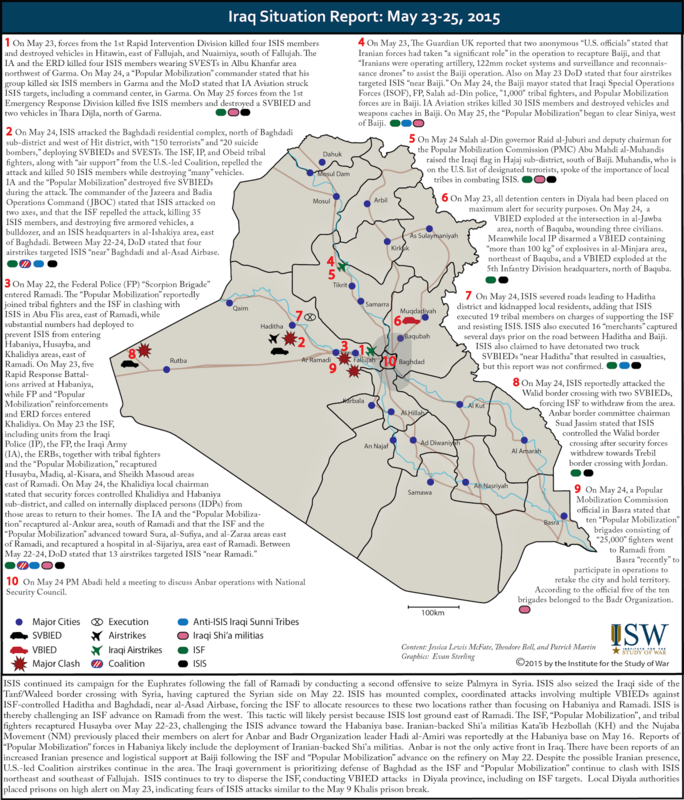 Key Takeaway: ISIS’s seizure of Ramadi city May 15-18 has altered disposition of the Iraqi Security Forces (ISF) in Anbar province and challenges the Iraqi government’s ability to mount successful counteroffensives. The two primary military positions remaining in Anbar after Ramadi’s fall are Habaniya, east of Ramadi and al-Asad airbase, west of Hit. As of May 27 “thousands” of Shi’a militia members continue to arrive at the Habaniya base following the Iraqi Prime Minister’s call for the Popular Mobilization Commission to prepare for operations in Anbar. In contrast, the ISF in al-Asad airbase are supplemented by Sunni tribal fighters undergoing training by U.S. personnel. It remains to be seen how the Iraqi government will integrate the efforts of its forces at al-Asad and Habaniya bases to mutually beneficial effect, especially in light of the U.S. presence at al-Asad and the Iranian-backed militias' presence at Habaniya. On May 26 the Popular Mobilization Commission launched a joint operation with the ISF to recapture parts of Ramadi as well as northern and western Salah ad-Din. As of May 29 the ISF is contesting southern Ramadi and the ISF and the Popular Mobilization, including Iranian-backed Shi'a militias, have reported successes east of Fallujah, south of Samarra, and south of the Baiji Oil Refinery. The Iranian-backed Shi’a militias now play a prominent role in the province. These developments may also compromise the U.S. role in Anbar, a high risk given the presence of U.S. personnel at al-Asad airbase. The coordinated ISIS attack on Ramadi city on May 15 followed a near 18-month effort by ISIS to capture the city from the Iraqi Security Forces (ISF). 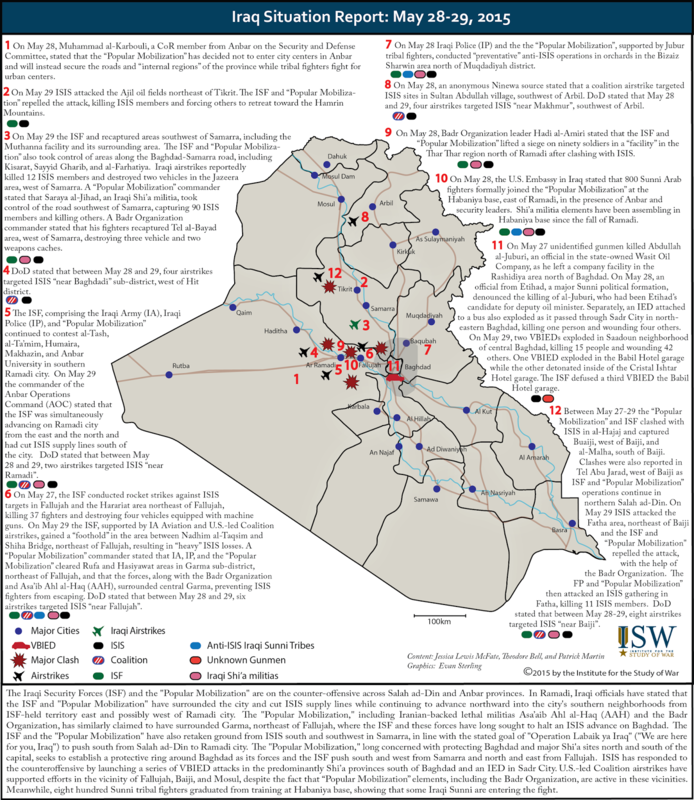 At the time of the attack the ISF units that had held the city's defenses included Iraqi Army (IA) units, the IA 1stRapid Intervention Division forces, the Federal Police, the Iraqi Police(IP), the Counter Terrorism Service (CTS), to include Emergency Response Brigade (ERB) forces, and were supported by local anti-ISIS Iraqi Sunni tribal fighters. The coordinated ISIS assault on downtown Ramadi initially targeted neighborhoods between Iraqi government and ISF locations in Ramadi city in an effort to disrupt ISF responses to the attack, which had proven successful at repelling ISIS many times in the past. On May 15 ISF forces at the Government Complex in central Ramadi withdrew to the Anbar Operations Command in the north of the city. ISIS managed to combine its coordinated assault on Ramadi city with operations elsewhere in Iraq on May 15, pressuring the ISF in multiple locations simultaneously. In Garma, northeast of Fallujah, ISIS also seized the Harairat factories area and also launched an attack on the IA 1stRapid Intervention Division HQ at Camp Mazraa, east of Fallujah. ISIS also launched an attack on Jubbavillage, north of Baghdadi sub-district from “all sides”, seizing vehicles and equipment. ISIS also managed to continue its siege of the residential complex in Baghdadi. 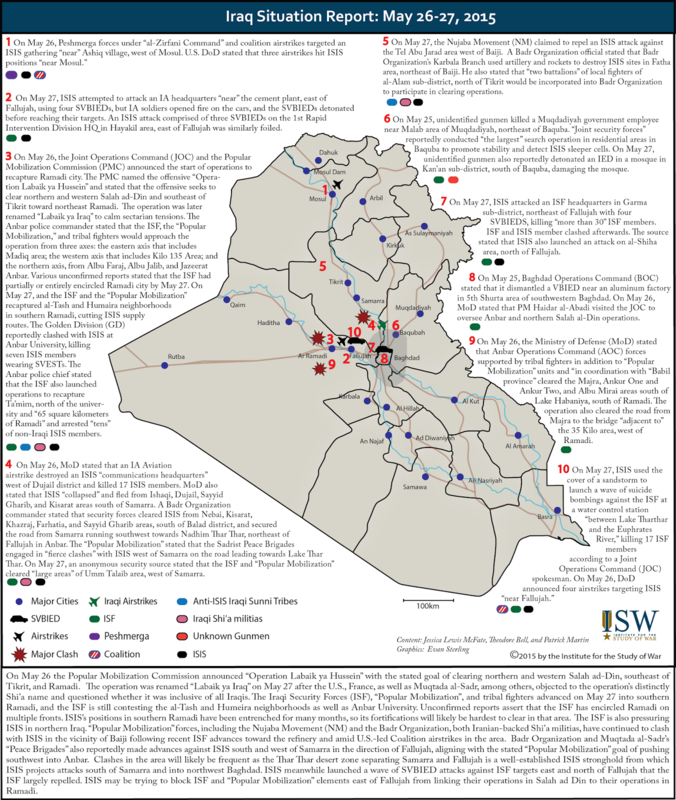 Despite the reported arrival of Golden Division, SWAT, and IA reinforcements in the vicinity of Ramadi late on May 15, ISIS continued to consolidate control over the city on May 16-17. On May 16, ISF in the 8th Brigade Headquarters held a defensive posture as ISIS attacked their positions in northwest Ramadi while forces at the Justice Palace and at Anbar Terrorism Directorate in the center of the city remained under siege. 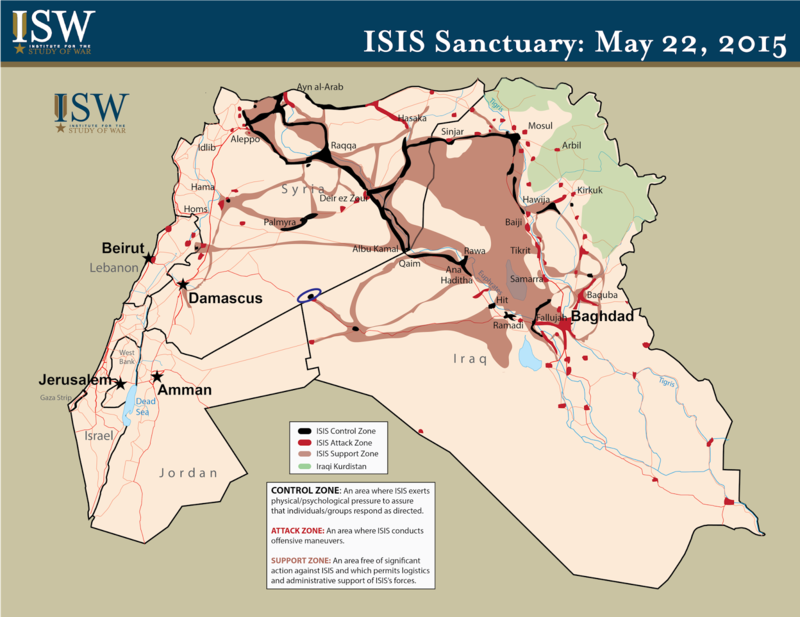 On May 17, ISIS took control of the AOC HQ while ISF withdrew to the “7km” area west of Ramadi. In the east, the ISF blocked the road between Habaniya base and Ramadi to prevent an attack by ISIS on the base while ISIS launched indirect fire on the nearby Khaldiya sub-district. Confronted with deteriorating security, the Prime Minister directed the Popular Mobilization Commission (PMC) to prepare for an operation in Anbar. Meanwhile, the Joint Operations Command (JOC) stated that the Prime Minister directed the “Popular Mobilization” and “all Jihadi factions” in a likely reference to the various factions of Shi’a militias, to prepare to enter Ramadi. Militias such as Kata’ib Hezbollah (KH) and the Nujaba Movement (NM) ordered their members to be on alert and for those on leave to return to duty in preparation for an operation in Anbar. Badr Organization leader Hadi al-Amiri and Federal Police (FP) commander Raid Shaker Jawdat reportedly arrived the Habaniya base to oversee operations. On May 19, the Iraqi Ministry of Defense circulated a video of ISF helicopters evacuating besieged ISF members from the Malab suburb of Ramadi. By May 18 “thousands” of Shi’a militia members had arrived at the Habaniya base alongside the ISF. On May 21 Minister of Defense Khalid al-Obeidi and senior Ministry of Defense (MoD) officials visited the Habaniya base and met with ISF and “Popular Mobilization” leaders, speaking to the high-level interest in and visibility of the fight for Anbar. On May 23 the ISF, "Popular Mobilization" forces, and anti-ISIS Iraqi Sunni tribal fighters launched an offensive against the Husayba area east of Ramadi. The "Popular Mobilization" reportedly including Iranian-backed Shi'a militias, deployed in substantial numbers to prevent ISIS from entering Habaniya, Husayba, and Khalidiya areas, east of Ramadi. On May 23, five Emergency Response Brigade (ERB) battalions arrived at the Habaniya base and proceededwith “Popular Mobilization” forces to Khalidiya as further “Popular Mobilization” and FP reinforcements arrived in Khalidiya. The ISF, including the Iraqi Police (IP), the Iraqi Army (IA), and the ERBs, together with tribal fighters and the “Popular Mobilization,” recaptured Husayba, Madiq, al-Kisara, and Sheikh Masoud areas east of Ramadi. On May 24, the Khalidiya local chairman statedthat the ISF controlled Khalidiya and Habaniya sub-district and called on internally displaced persons (IDPs) from those areas to return to their homes. The IA and the “Popular Mobilization” also recaptured al-Ankur area, south of Ramadi and the ISF and the “Popular Mobilization” also advanced towardSura, al-Sufiya, and al-Zaraa areas east of Ramadi, recapturing a hospital in al-Sijariya, area east of Ramadi. On May 26 the Popular Mobilization Commission announced the start of the “Labaik Ya Hussein” (“We Are Here for You, Hussein”) operation, which aims to liberate “northern Salah ad-Din and southeast of Tikrit, extending to northeast of Ramadi.” The the operation was renamed“Labaik ya Iraq” (“We Are Here for You, Iraq”) the following day after the previous name was widely criticized as sectarian, since it refers to a historically important Shi’a religious figure. Iraqi state TV statedthat the IA and “Popular Mobilization” forces had started moving toward Ramadi city (on May 27). Separately, Anbar police commander Maj. Gen. Hadi Razij statedthat the ISF, and the “Popular Mobilization”, and tribal fighters would participate in the operation to liberate Ramadi and that it will launch on three axes: from Madiq area in the east, from the Kilo 135 Area in the west, and from Albu Faraj, Albu Jalib, and Jazeerat Anbar areas in the north. Anbar provincial council member Athal al-Fahdawi stated that the ISF had cut off ISIS supply lines “south of Ramadi” and Maj. Gen. Razij later stated that the IA, IP, and “Popular Mobilization” had surroundedRamadi and were advancing from the east and the south. Over May 26-27 the ISF and “Popular Mobilization” forces launchedindirect fire on Ramadi city began contesting Anbar University and the al-Tash and Humeira areas south of Ramadi, clashing with ISIS fighters who detonated SVESTs. The elite Golden Division (GD) reportedly clashed with ISIS at Anbar University, killing seven ISIS members wearing SVESTs. The Anbar police chief stated that the ISF also launched operations to recapture Ta’mim, north of Anbar University and arrested “tens” of non-Iraqi ISIS members. The anti-ISIS fight has been augmented by the introduction of the “Popular Mobilization” and Shi’a militias into Ramadi’s security plan, but it may also be fundamentally undermined by their arrival. These forces now play dominant roles in anti-ISIS operations in Garma, northeast of Fallujah and in south of Fallujah, positions protecting Baghdad from ISIS in Anbar. They are also now present in large numbers at Habaniya base, and they are conducting joint offensives with the ISF that are credited with early successes. This posture largely reverses the gains that the ISF experienced after the fall of Tikrit in reasserting their dominance over the militias. Meanwhile ISF units supported by the U.S. remain in control of Haditha, al-Asad airbase, and Baghdadi in western Anbar, positions that used to constitute the strategic reinforcement to Ramadi from the west when ISIS previously attacked the city. ISIS has pre-empted their eastward assault by launching coordinated and persistent attacks on the two locations between May 17 and May 26. The arrival of the militias further complicates ISF-driven operations supported by U.S. airstrikes from western Anbar to help retake Ramadi. The next steps in the Iraqi government’s anti-ISIS fight must therefore be understood in the context of the new ISF disposition in Anbar, in which Ramadi-based units have withdrawn to Habaniya and are guarding the road to Baghdad with tribal fighters and “Popular Mobilization” elements, including lethal Iranian-backed Shi’a militias that are not commanded and controlled by the Prime Minister. 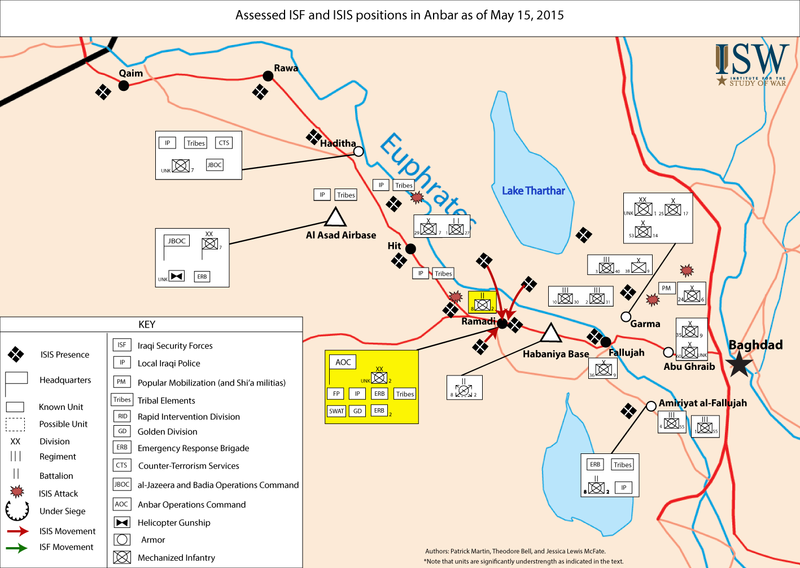 Graphical Note: The yellow coloring on the May 15, 17, and 24 maps is meant to highlight the most notweorthy element of the ISF deployment for the viewer. 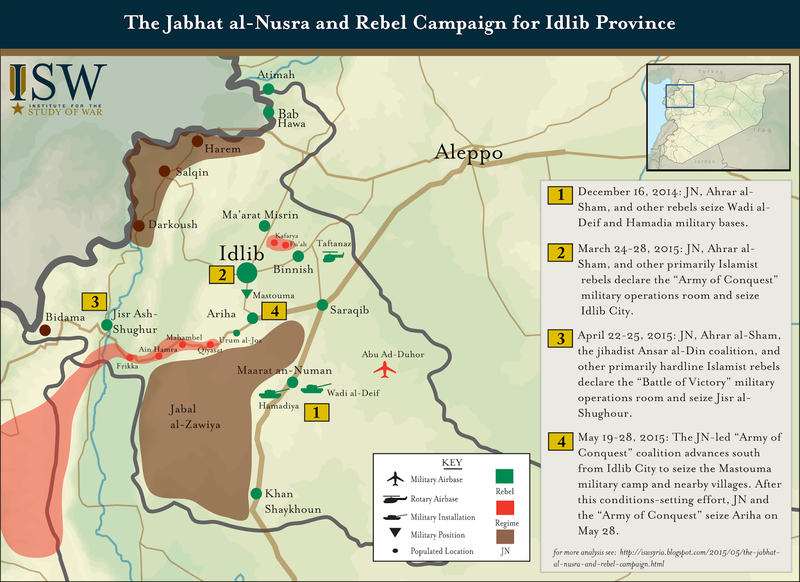 Syrian al-Qaeda affiliate Jabhat al-Nusra (JN) seized control of Ariha, the final regime stronghold in Idlib Province, alongside allied Islamist rebels on May 28, 2015. This victory secures effective control over Idlib Province to JN and rebel forces, the second Syrian province to fall out of Assad’s control after ISIS-held Raqqa. A number of isolated and besieged regime positions remain in Idlib, including the Abu ad-Duhor military airbase that has been under JN siege since December 2014. Regime forces have reportedly begun to withdraw from villages along the Ariha- Jisr al-Shughour road as they absorb the loss of Ariha, indicating that JN and rebel forces are unlikely to face considerable resistance as they move to consolidate control over remaining pockets of regime-held terrain. Moderate rebel forces in the province played relatively marginal roles in the recent advances, often limited to providing artillery and other support to hardline Islamist and jihadist groups allied to JN. As a result, JN and its allies are likely to acquire a high level of influence in the governance and security structures that emerge in the newly-“liberated” province as a consequence of their significant military contributions to anti-Assad victories. This is a major strategic setback for the U.S. in Syria, as it cements JN gains in northern Syria to date, validates its methodology, and provides considerable momentum to its carefully tailored effort to mold rebel-held Syria into a post-Assad state that is governed by Shari’a law and ultimately a component of al-Qaeda’s envisioned global Caliphate. The regime continues to respond to military defeats with the indiscriminate use of airpower, barrel bombs, and weaponized chlorine gas attacks, and can be expected to maintain its effort to punish civilian populations in Idlib as anti-Assad forces formalize their control. 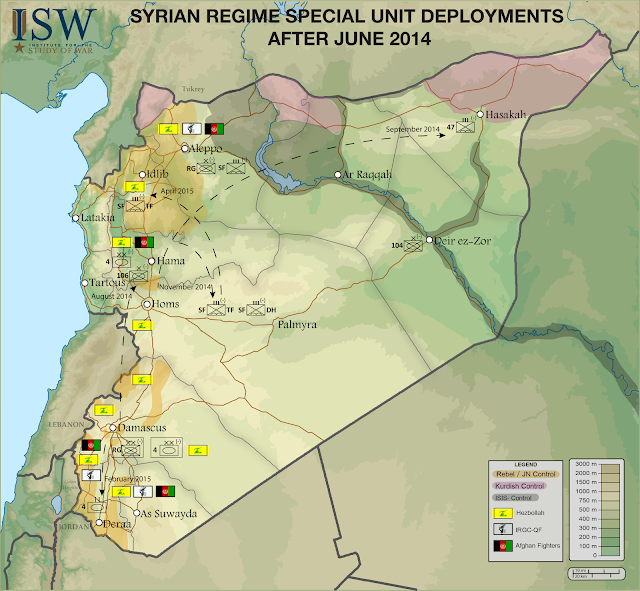 This analysis of the Syrian regime’s military capabilities is adapted from the ISW report “An Army in All Corners”--Assad’s Campaign Strategy in Syria by ISW Syria Analyst Christopher Kozak (April 2015). 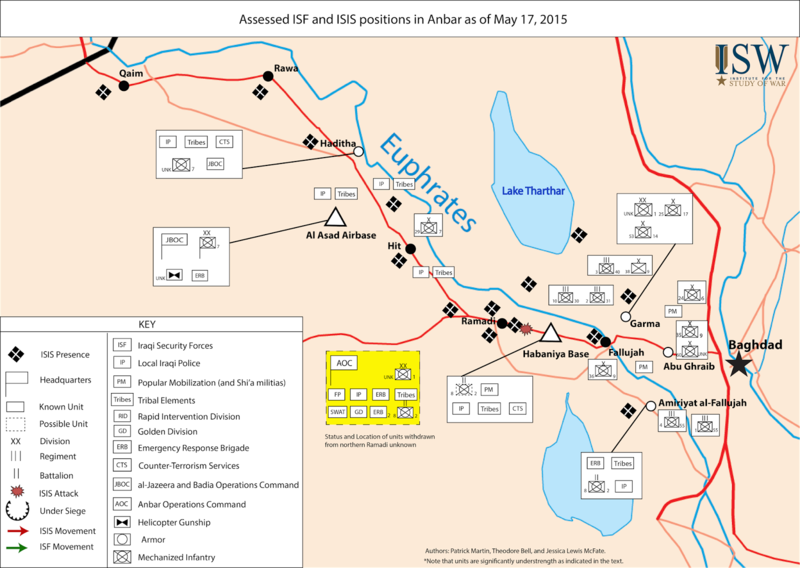 Today's excerpt looks at the Iranian proxies operating in Syria. The final installment in this series will focus on the regime’s offensive campaign in and around Damascus. Read the previous installments on: the regime's strategic objectives and the regime’s military capabilities (Part 1). 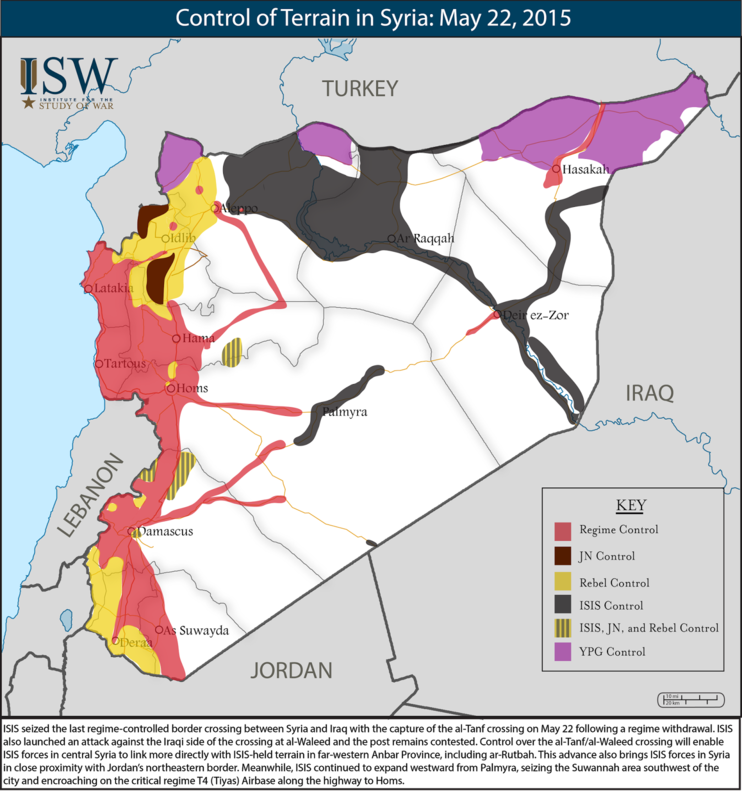 May 29 Update: As ISIS consolidates its grip over the strategic central Syrian city of Palmyra and JN-led rebel forces move towards securing full control over Idlib Province in the north, the Syrian regime has come to rely upon increasing support from the Islamic Republic of Iran. Last week, Syrian President Bashar al-Assad met with a senior advisor to Iranian Supreme Leader Ayatollah Ali Khamenei in Damascus who emphasized that “Iran is determined to continue to stand by Syria and support it with whatever is needed”. A day later, Iranian officials reportedly approved a new line of credit and several investment deals with the embattled Assad regime. However, Iranian assistance to Assad does not end at financial support. Iran has provided increasing amounts of advisors, technical experts, and foreign fighters to bolster the Syrian regime’s war-fighting capacity through both the indirect participation of Iranian proxy groups such as Lebanese Hezbollah and the direct intervention of Iranian Revolutionary Guard Corps (IRGC) members. Below you will find details about the spectrum of Iranian forces currently operating in Syria and the implications for the wider region. The Assad regime suffers from several limitations which have had a severe impact upon its military strategy. Regime forces operated under shortages of quality manpower due to desertion, defection, and combat attrition. Consequently, the Assad regime relied upon a constellation of regular and irregular forces throughout 2014 in order to prosecute its offensive campaign and defend its core interests against the Syrian opposition and other threats, including ISIS. The network of pro-regime fighters lacked the capacity to deliver a clear victory over rebel forces due to deficits in manpower, morale, and battlefield acumen. However, Assad, with likely impetus from his Iranian advisors, used this time to restructure his forces in a manner designed to sustain their operations in conditions of protracted war. These developments ensure the survival of the regime at the cost of extended humanitarian suffering and deepening polarization. An examination of the ‘tools’ available to the regime is essential to understanding the conduct of the Syrian military campaign throughout 2014 and into 2015. The main components of the force coalition preserving Assad’s position in Syria include the Syrian Arab Army, pro-regime Syrian paramilitary organizations, Iranian foreign proxy fighters, the Iranian Revolutionary Guard Corps (IRGC), and the regime’s own asymmetric military arsenal. The Assad regime relies upon the coalition of Shi’a foreign fighters referred to as the Iranian “Axis of Resistance” that is organized, trained, and equipped by Iran. Assessments released in December 2013 estimated that between 7,000 and 8,000 foreign fighters drawn from Iranian proxy groups were engaged in active combat in Syria on behalf of the regime. These forces played important roles on critical battlegrounds across Syria due to their expertise in irregular combat. Lebanese Hezbollah plays a dominant role, with Israeli military officials assessing in summer fighters on rotation in Syria in Damascus, Qalamoun, Homs, Latakia, Aleppo, and southern Syria. Hezbollah militants provided key training and leadership functions to pro-regime paramilitary organizations such as the NDF along with their frontline combat duties. The Syrian regime also received reinforcements from Iraqi Shi’a militias as well as Lebanese and Afghan Shi’a populations who joined front groups such as Liwa Abu Fadl al-Abbas (LAFAB) and Liwa Zulfiqar. An estimated 3,000 to 4,000 Iraqi, Lebanese, and Afghan Shi’a fighters were fighting alongside the regime in Syria by June 2014, concentrated mainly in Damascus and Aleppo cities. 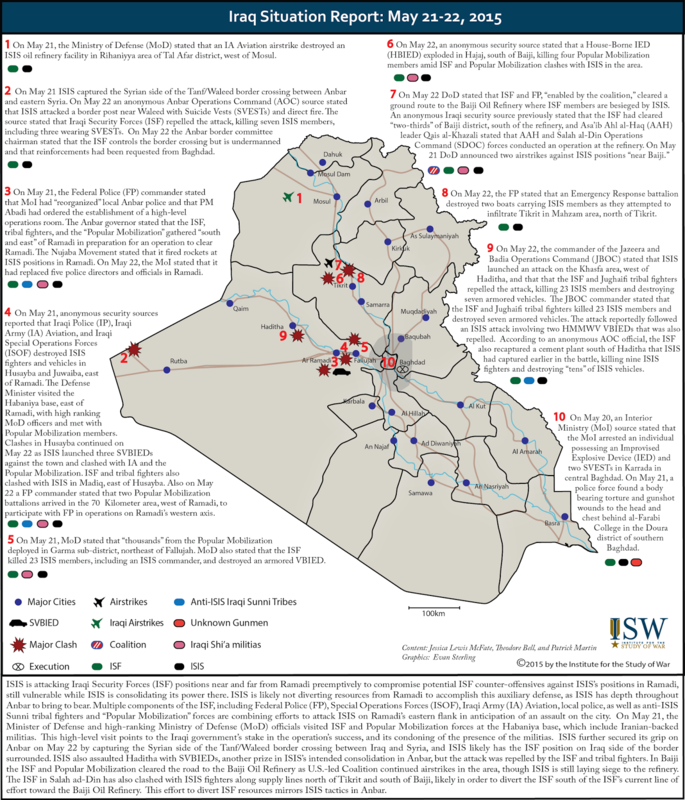 The fall of Mosul to ISIS on June 10, 2014 and the rapid expansion of ISIS-held terrain inside Iraq redirected Iranian attention from Syria to Iraq. This was a major inflection point for both Iranian regional strategy and the disposition of Iranian proxy forces inside Syria. Large numbers of Iraqi Shi’a withdrew from such Syrian battlefronts as southern Aleppo city and Mleiha in Damascus in order to return to Iraq, forcing the regime to recalibrate ongoing offensives. One rebel fighter in Mleiha stated that “we used to hear fighters with Iraqi accents on our radios, but now they have Lebanese accents…since last week, we haven’t seen as much shelling or storming of our positions.” Iranian news sources reported that a large portion of Liwa Abu Fadl al-Abbas specifically traveled to the Balad district north of Baghdad in order to counter ISIS advances there. Over 1,000 Iraqi Shi’a fighters had reportedly left Syria to fight in Iraq by June 17. Hezbollah quickly expanded its combat operations to compensate for the departure of Iraqi Shi’a militias from the battlefield, as foreshadowed by the rebel fighter interviewed above. Hezbollah announced a general mobilization on June 12, 2014, two days after the fall of Mosul, and deployed more than 1,000 fighters to “defend the Sayyida Zeinab shrine.” Casualties mounted as rebel forces utilized the resultant disruption to mount successful raids and ambushes against Hezbollah positions, particularly in the Qalamoun region. The growing commitments in Syria stretched Hezbollah thin and forced it to adjust its recruitment standards. Hezbollah began enrolling Syrian citizens into Hezbollah-affiliated forces by June 2014 and deployed increasing numbers of young, inexperienced Lebanese fighters to the frontlines. This was a stark contrast to the seasoned fighters who had participated in the battle for Qusayr. One Hezbollah veteran complained in an interview with Foreign Policy in January 2015 that he “barely recognized” the organization due to the lack of discipline displayed by its new recruits. Hezbollah fighters have nevertheless maintained a major presence in the Qalamoun Mountains while playing a prominent role in key regime offensives in Damascus, Aleppo city, the southern provinces of Dera’a, and Quneitra near the Israeli-controlled Golan Heights over the course of late 2014 and early 2015. The fall of Mosul also prompted a demographic shift in the Shi’a foreign volunteers fighting alongside the Assad regime. Replacements for the dwindling number of Iraqi Shi’a in Syria came from Afghanistan’s Shi’a Hazara community, which speaks dialects of Persian and possesses close historical ties to Iran. News reports as early as 2013 indicated that the Iranian Revolutionary Guard Corps had enlisted thousands of Afghan refugees to fight in Syria in exchange for $500 monthly salaries, school registration, and Iranian residency permits. Afghan fighters captured in Syria in October 2014 have, however, confirmed these reports, stating that Iran had also provided training in light and medium weapons. Funeral notices in March 2015 for Ali Reza Tavassoli, the Iranian commander of the majority-Afghan “Fatimiyoun Brigade,” highlighted the link between Afghan Shi’a fighters and the IRGC by revealing a close relationship between Tavassoli and IRGC-Quds Force commander Qassem Suleimani. Afghan Shi’a fighter participation alongside the Assad regime became increasingly visible throughout the latter half of 2014 and into 2015. Iraqi and Iranian fighters in Liwa Abu Fadl al-Abbas reportedly continued to conduct operations alongside regime forces in lesser numbers in the outer environs of Damascus city, particularly the towns of al-Zabadani and Darayya as of March 2015. A pro-regime fighter captured by rebel forces in October 2014 claimed that LAFAB was also active in the northern outskirts of Aleppo city. Unconfirmed reports throughout late 2014 and early 2015 also indicated that smaller numbers of fighters from other Shi’a Muslim communities, including ethnic Sham from Cambodia and Houthi tribesmen from Yemen, have been mobilized by the IRGC on behalf of the Assad regime. Official Iranian military presence became more visible in Syria in 2014 in tandem with the growing visibility of Iranian proxy forces. IRGC-Quds Force (IRGC-QF) and IRGC-Ground Forces (IRGC-GF) personnel operated inside Syria in 2012-2013, providing intelligence, paramilitary training, and senior-level advisory support to the Assad regime. Direct Iranian support to Assad serves to preserve the existence of a friendly regime in the heart of the Middle East bordering the Israeli-occupied Golan Heights. Syria also provides Iran access to key supply routes used to deliver weapons to other regional Iranian proxies, including Lebanese Hezbollah and Hamas. Heavy involvement in the organization of paramilitary groups and foreign volunteer units in Syria has allowed Iran to develop a base of support which could preserve Iranian regional influence even if the Assad regime collapsed. Over time the Iranian advisory mission evolved to encompass IRGC trainers directly embedded with pro-regime forces. The exact extent of IRGC presence within Syria remains difficult to quantify. One former senior Iranian official stated to a Reuters reporter in February 2014 that a “few hundred” IRGC-QF and IRGC-GF commanders operated in Syria, while a former IRGC commander told the same reporter that only sixty to seventy “top” Quds Force commanders were in the country at any one time. Both sources also indicated that volunteers from the Iranian ‘Basij’ paramilitary formed a component of the irregular forces operating under IRGC command in Syria. The depth and breadth of Iranian involvement in Syria grew significantly through 2014 and into 2015. Opposition sources consistently reported throughout the summer of 2014 the presence of unspecified Iranian officers and fighters on the frontlines in northern Hama Province amidst rebel offensives which directly threatened the Hama Military Airport. Activists claimed in September 2014 that regime offensives in the area were jointly commanded by SAA Special Forces commander Col. Suhail al-Hassan and a “young IRGC officer.” Rebel sources also stated in late November 2014 that IRGC advisors participated alongside Lebanese Hezbollah in an offensive on the town of Sheikh Miskin in Dera’a Province. These reports raise key questions about the extent to which Assad and senior regime officials have subordinated the Syrian military campaign to Iranian interests. Mounting reports of Iranian casualties also served as an indicator of the ongoing shift from senior-level IRGC advisement to direct IRGC field command over pro-regime forces. Rebel forces killed and beheaded IRGC-GF Brigadier General Abdollah Eskandari on May 28, 2014 near the town of Morek in northern Hama Province. Iranian media claimed that Eskandari, the head of the Fars Province Foundation for Martyrs and Self-Sacrifice Affairs until 2013, had died protecting the Sayyida Zeinab shrine in Damascus. IRGC ‘Basij’ commander General Jabbar Drisawi was killed on the Handarat front north of Aleppo city five months later on October 16, 2014. Drisawi was reportedly an Arab, making it likely that he served as an Arabic-speaking trainer and advisor for Syrian NDF forces. Regional news sources reported three days later that IRGC commander Hassan Hizbawi had been killed in Sheikh Miskin. The presence of these senior Iranian officers in such close proximity to active frontlines suggests that IRGC commanders have directly embedded with pro-regimes forces on the battlefield. A recent counteroffensive against rebel forces in southern Syria offers the most dramatic indicator of the influence currently wielded by IRGC-aligned forces in Syria. A large force of Hezbollah, Liwa Abu Fadl al-Abbas, and Fatimiyoun Brigade fighters supported by regime forces launched a major attack along a thirteen kilometer stretch of northwestern Dera’a Province on February 9, 2015, successfully seizing several key positions held by opposition forces. The leading role played by the large number of Iranian proxy forces participating in this operation suggests heavy IRGC involvement in its design and execution. Notably, an Israeli airstrike three weeks prior to the start of the offensive killed several senior Hezbollah figures in Quneitra province as well as IRGC-QF Brigadier General Mohammad Ali Allahdadi, who reportedly served as the IRGC liaison to the Assad regime. The emplacement of Hezbollah and other Iranian proxy forces along the border with the Israeli-controlled Golan Heights is likely a key strategic objective of Iran in Syria. Taken in conjunction, these incidents may thus reflect the deepening extent which Iranian interests play in directing regime military campaigns, particularly in southern Syria. Several key indicators support reports of direct Iranian supervision over the military campaign in southern Syria. Numerous relatively low-ranking IRGC members were reportedly killed during the February 2015 offensive in Dera’a Province, including Fatimiyoun Brigade commander Ali Reza Tavassoli, IRGC 2nd Lieutenant Mohammad Ardekani, and IRGC Captain Mohammad Sahib Karam, suggesting a heightened presence of embedded Iranian advisors. 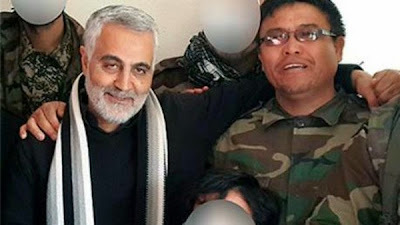 IRGC-QF commander Qassem Suleimani also reportedly visited pro-regime units in Dera’a in February 10, 2015, providing weight to claims of senior Iranian command-and-control over the operation. Meanwhile, pro-opposition sources reported that Iranian officers executed up to a dozen Syrian regime personnel on charges of collaborating with rebel forces in the lead up to the offensive. Regime Political Security head Rustom Ghazali, a resident of Dera’a Province, was sacked and reportedly beaten for his alleged opposition to the prominent role played by Iranian-aligned forces in southern Syria. These reports marked a major departure in the pattern of Iranian operations in Syria, suggesting both the depth of Iranian interest in southern Syria as well as growing regime and Iranian concern regarding opposition momentum in Dera’a and Quneitra Provinces. The IRGC has simultaneously worked aggressively to expand its recruitment of Syrian civilians in order to build an indigenous paramilitary apparatus that would remain loyal to its interests in the event of a collapse of the Assad regime. In a speech given in May 2014, IRGC-GF Brigadier General Hossein Hamedani lauded the establishment of a so-called “second Hezbollah” in Syria. Anonymous sources suggest that the Quds Forces seeks to maintain a “Syrian Hezbollah” comprised of Iraqi, Lebanese, and Syrian volunteers which could serve as a direct military liaison and Iranian proxy for the indefinite future. Although this organization likely serves as a blanket term for the coalition of paramilitary and proxy groups organized by Iran in Syria rather than a distinct military entity, Iran almost certainly seeks to build a military structure which can continue to assert Iranian influence in Syria in the event of the severe weakening or collapse of the Assad regime. Several reports of independent IRGC recruitment efforts in Syria in late 2014 support the notion that the formation of a Syrian proxy force directly commanded by the IRGC is an Iranian priority. An activist in Hama interviewed in February 2015 stated that IRGC officers oversee an enlistment campaign in the city which directly competes with regime Air Force Intelligence for new recruits. Rebel sources also claim that the IRGC conducts similar recruitment in rural Homs Province. Regional observers have also noted the presence of Syrian Shi’a paramilitary organizations modeled on Hezbollah, such as the National Ideological Resistance, which operate in coastal Syria and may form the core of the IRGC vision of a “Syrian Hezbollah.” Iran appears to be nurturing this pool of future manpower through religious outreach. For example, Iranian-funded Shi’a theology schools have begun spreading throughout Tartous Province in a move designed to strengthen an Iranian-style Shi’a religious identity among Syrian Alawites. IRGC Brig. Gen. Hamedani has also personally praised the establishment of ‘Keshab’ youth groups in Syria meant to promote “spirituality” and the “revolutionary values” of the Islamic Republic. These developments suggest that Assad may no longer be a fully autonomous actor and ultimately threaten regime control over its own security forces. This analysis of the Syrian regime’s military capabilities is adapted from the ISW report “An Army in All Corners”: Assad’s Campaign Strategy in Syria by ISW Syria Analyst Christopher Kozak (April 2015). Today's excerpt looks at the Syrian Arab Army, paramilitary organizations, and the regime's“asymmetric” capabilities, such as its air force, missiles, and chemical weapons. The next installment in this series will focus on the Iranian proxies in Syria. 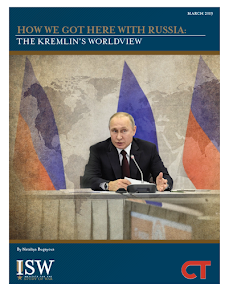 Read the first installment on the regime's strategic objectives here. May 26 Update: On May 24, the regime-appointed governor of Homs Province Talal Barazi claimed that regime forces are preparing for a counteroffensive targeting the strategic city of Palmyra after its fall to ISIS on May 20. However, clear indications of a military mobilization have yet to materialize and it remains unclear whether the Assad regime possesses sufficient combat reserves to significantly reverse ISIS’s recent gains. Regime forces are spread thin throughout the country, forcing Assad to rely upon a small number of trusted elite units and deployable paramilitary fighters – the same composition of forces allegedly participating in the operation to retake Palmyra - to react to emergent threats. The Syrian Arab Army (SAA) functioned as a mainstay of the Syrian regime throughout 2014 and into 2015. 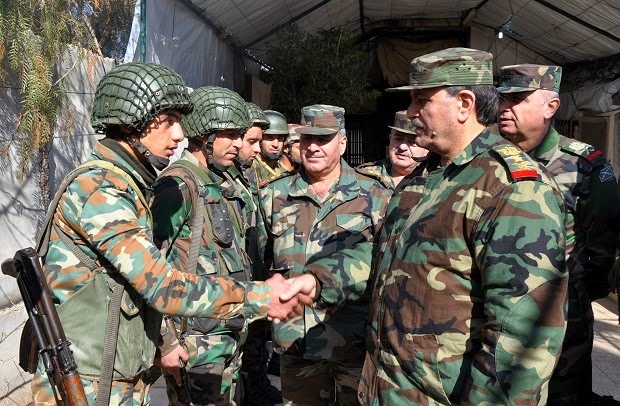 The Syrian Army as an institution retained its loyalty to President Bashar al-Assad despite the defection of sizeable numbers of SAA soldiers throughout 2011 and 2012. Syrian forces remaining on the battlefield are battle-tested and largely committed to the survival of the regime. However, over the past year the Syrian Arab Army continued to grapple with two chronic problems that constrained the regime’s ability to effectively deploy its conventional advantage against opposition forces. For one, the Syrian Arab Army continues to suffer severe manpower problems due to ongoing pressures of defection, desertion, and combat attrition in 2015 (read “The Assad Regime UnderStress: Conscription and Protest among Alawite and Minority Populations inSyria”). Three years of war have reduced the SAA by nearly half, from a pre-war high of approximately 300,000 troops to a 2014 estimate of 150,000-175,000 men. These sharp reductions stretched the SAA’s ability to hold terrain and forced the regime to prioritize the use of its limited offensive capability. Manpower shortages also prevent the SAA from decisively defeating the Syrian opposition on the battlefield. Military analyst David Kilcullen estimated in March 2014 that pro-regime forces maintained at maximum only a 2.5-to-1 soldier-to-insurgent force ratio against the Syrian opposition at that time,27 a condition which has likely deteriorated further one year later. Kilcullen also noted that the Assad regime possessed less than half of the troop-to- population ratio traditionally assessed as necessary for a successful counterinsurgency campaign. The Syrian Arab Army also remained handicapped by regime suspicions regarding the loyalty and reliability of mainline SAA combat units. Analysis of the Syrian Army’s 2011-2012 military campaign suggested that the regime could only reliably deploy 65,000 to 75,000 of its troops in offensive operations, mainly elite units such as the Republican Guard, the Special Forces, and the 4th Armored Division commanded by President Assad’s brother Maher al-Assad. Meanwhile, regular army units – mainly comprised of rank-and-file conscripted Sunnis deemed ‘untrustworthy’ by the regime – were confined to defensive positions or limited offensives in close proximity to their bases. In the words of one Damascus based SAA commander in April 2013, “Most of the soldiers in my unit are Sunnis. 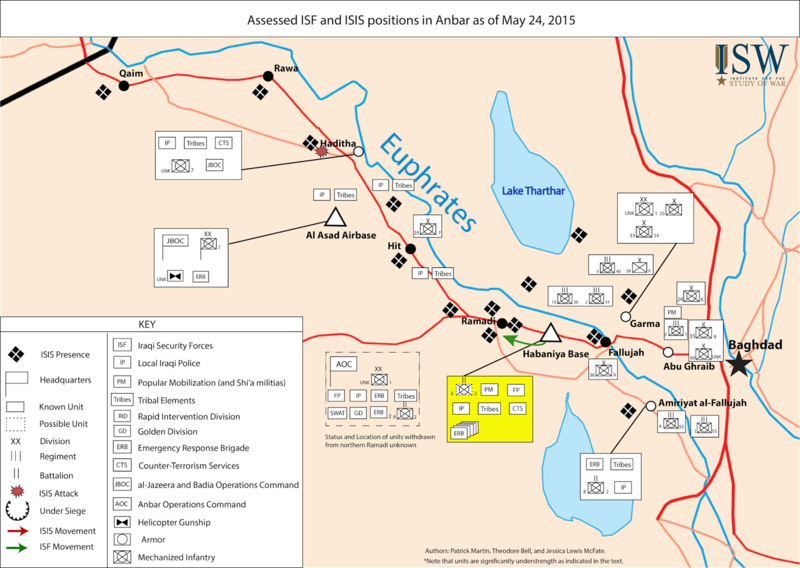 They don’t trust me, and I don’t trust them.” Two years later, the vast majority of regular SAA units remained bound to their assigned home stations, largely concentrated in Dera’a and Damascus Provinces as an artifact of a pre-2011 military doctrine designed to provide defense in depth against an Israeli offensive towards Damascus. The Syrian regime continued to rely upon its trusted elite SAA units throughout 2014 as a mobile offensive force often dispatched to augment regular SAA forces along critical battlefronts. Throughout 2014 and early 2015, the Republican Guard and 4th Armored Division, units specifically designated to protect the regime, conducted most of their operations in the vicinity of Damascus targeting major pockets of opposition forces occupying the Eastern and Western Ghouta suburbs of the city. Detachments from these units have also been deployed throughout the country in order to reinforce priority fronts. A detachment of the 104th Republican Guard Brigade under the command of Brigadier General Issam Zahreddine deployed to Deir ez-Zour Military Airbase in early 2014 to bolster its beleaguered defenders and preserve the regime presence in Deir ez-Zour city. Elements from the 106th Republican Guard Brigade and the 4th Armored Division also participated in repelling a rebel offensive against the Hama Military Airport in late 2014. The Republican Guard sent multiple waves of reinforcements to Aleppo city throughout 2014 to assist the regime encirclement campaign of the city, while the 4th Armored Division provided at least forty tanks to support a joint regime-Hezbollah offensive in Dera’a Province launched in February 2015 meant to reverse significant rebel gains. Special Forces regiments of the SAA in particular are employed as quick-reaction forces across Syria. In an interview with the BBC in November 2014, one Special Forces commander recited his deployments: a year-and-a-half in Idlib Province, seven months in Aleppo city, and sixteen months in the Damascus suburbs. The Suqour al-Sahara [Desert Hawks] Brigade of the Special Forces spent most of late 2014 and early 2015 combatting ISIS militants in eastern Homs Province with future reassignments planned to either Aleppo or Dera’a Province. The 47th Special Forces Regiment, typically based out of Homs and Hama Provinces, deployed to northeastern Syria in late 2014 to confront ISIS in Hasaka Province. This rapid cycling of combat tours provides a clear indication of the regime’s reliance on a small but loyal core of elite forces and suggests limited availability of elite troops, causing Assad to continually redirect these forces against emergent threats in a reactive manner. The repeated deployments of a small number of military units also fuels increasing decentralization within the Syrian Arab Army. Elite SAA units such as the Republican Guards have been consistently deployed across the country in small-scale contingents as both independent detachments and as embedded reinforcements to regular SAA units over the past several years. These observations suggest that the SAA has restructured in favor of smaller military formations directed by command-and-control elements located in the field rather than in rear headquarters. This is likely an adaptation reflecting the demand for forward leadership in remote locations, possibly due to low conscript morale. This trend towards decentralization within the formal Syrian Arab Army represents a complementary process to the increasing regime reliance on paramilitary militia organizations. The Assad regime has increasingly come to rely upon the mobilization of loyalist paramilitary and militia organizations in 2014-2015 as a solution to the endemic problem of manpower in the Syrian Arab Army. Regime supporters mobilized community-level patronage networks in the early months of the Syrian Revolution in order to mobilize hundreds of disparate ‘shabiha’ criminal gangs and ‘Popular Committee’ neighborhood defense groups. The Syrian regime incorporated the shabiha into an organization called the National Defense Forces (NDF) in early 2013. Members of the NDF received licensing, armaments, and salaries directly from the Syrian regime according to August 2013 reporting. Syrian security officials admitted shortly thereafter that assistance from Iran and Lebanese Hezbollah played a key role in the formalization of the NDF along the model of the Iranian ‘Basij’ militia. NDF recruits received training in urban guerilla warfare from Iranian Revolutionary Guard Corps (IRGC) and Hezbollah instructors at facilities inside Syria, Lebanon, and Iran. There are no indications that the nature of this partnership has changed as of April 2015. The National Defense Forces functionally became a branch of the regime military by early 2014. 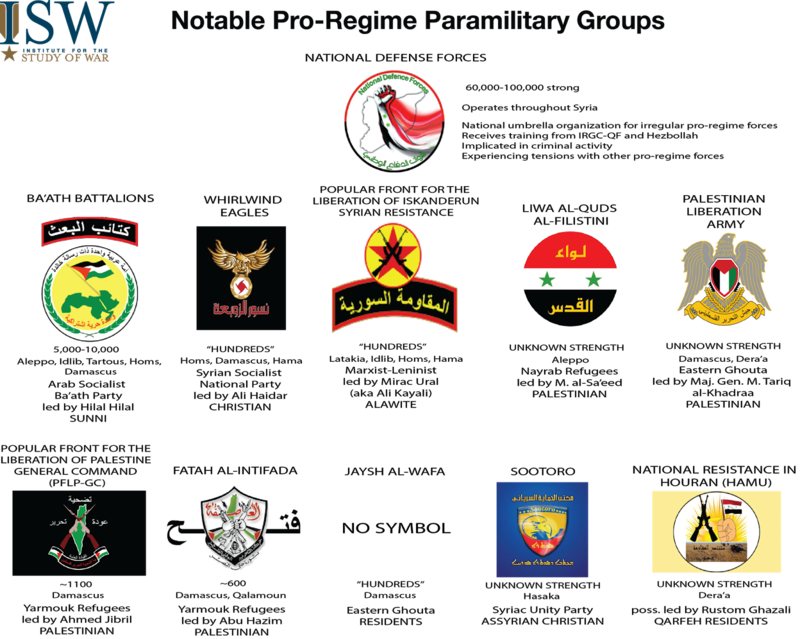 The new organization soared in membership, with estimates ranging from 60,000 to 100,000 fighters available to hold territory, guard key supply routes, and otherwise augment SAA forces in the field by March 2014. Two Western correspondents reported in February 2015 that every checkpoint along a long and winding 1,200 kilometer journey from Aleppo city to Damascus had been manned by NDF militiamen instead of regular SAA soldiers. The Assad regime sought to leverage the growing strength of volunteers in the National Defense Forces throughout 2014 as an alternative to the conscripted forces of the regular SAA. Many enlistees preferred the NDF due to the organization’s emphasis on hometown service, making it an attractive alternative to service in the SAA. The regime in response turned to incentive structures and pay scales in order to encourage frontline duty. Regime commanders, according to a November 2014 report, retained the authority to relocate NDF units to active conflict zones if circumstances warranted. Increasing regime reliance on the NDF has opened the regime to the inherent risks of providing state-sanctioned power to decentralized paramilitary organizations. The National Defense Forces, the Carter Center notes, are “still, at their core, community-based militias whose local interests may at times be at odds with national-level government strategies.” Local NDF commanders often engage in war profiteering through protection rackets, looting, and organized crime. NDF members have been implicated in waves of murders, robberies, thefts, kidnappings, and extortions throughout regime-held parts of Syria since the formation of the organization in 2013. This tradeoff between security and lawlessness generated by the devolution of further power to local militia formations ultimately poses a threat to Assad’s ability to maintain agency over his military campaign. Units of the National Defense Forces have also come into increasing conflict with official representatives of the Assad regime. The growing excesses of the NDF forced Assad to undertake efforts to rein its irregular forces back under state control. Reports emerged in November 2014 indicating that the Assad regime intended to announce several initiatives to restructure the NDF into “National Security Committees” in order to establish greater control.64 Members of the National Security Committees would hold two to ten year contracts and answer directly to the Syrian Ministry of Defense. Several sources also indicated that the Committees would incorporate former rebel fighters and other “dissident troops” as part of a process of “national reconciliation.” Assad may have calculated that integrating former opposition members and NDF militiamen under one umbrella could entice further rebel defections with a clear demonstration of amnesty. The integration of former rebel fighters into the “National Security Committees” would also build an internal tension into the organization which would keep its constituent factions in check. However, besides isolated complaints in late 2014 that the regime had ceased paying NDF salaries on time, no further indications of this reconciliation program have emerged as of April 2015. The fragmentation of authority presented by the National Defense Forces is compounded by the presence of dozens of smaller, local pro-regime paramilitary forces operating outside the bounds of the NDF structure. These actors maintain a wide variety of affiliations and dispositions, such as those detailed in the corresponding chart, and all remain active in 2015. Dozens of other locally-focused paramilitary groups continue to exert influence in their immediate community outside the structures of the NDF. The widespread dissemination of these paramilitary organizations serves the immediate military interests of the Assad regime but ultimately constrains state power in a manner which threatens to promote the spread of further disorder. The intricate pro-regime coalition of regular, irregular, and Iranian proxy forces fighting on behalf of Assad in Syria remains insufficient to exert the regime’s influence across all of Syria. The Assad regime has thus made heavy use of the asymmetric capabilities at its disposal to gain advantages over rebel forces on the battlefield with minimal military risk. These strategic weapons systems, including a sizeable air force, a ballistic missile arsenal, and a chemical weapons program, partly compensate for the limitations of pro-regime ground forces. These weapons are ultimately insufficient to overcome opposition forces despite serving a key function in the survival of the Assad regime. Instead, they depopulate and demoralize opposition-controlled areas. The indiscriminate nature of regime airstrikes and chemical weapons attacks results in continued humanitarian disaster on a massive scale and fuels the narrative of jihadist factions which accuse the regime of conducting a systematic sectarian campaign to destroy Syria’s Sunni population. The air assets provided by the Syrian Air Force have been one of the primary advantages the Assad regime holds over rebel forces. Separate analyses of regime airstrike patterns in 2012 and 2014 concluded that the Syrian Air Force only possesses between 200 and 300 combat-capable aircraft due to maintenance requirements, poor optimization for ground attack roles, and wartime attrition. 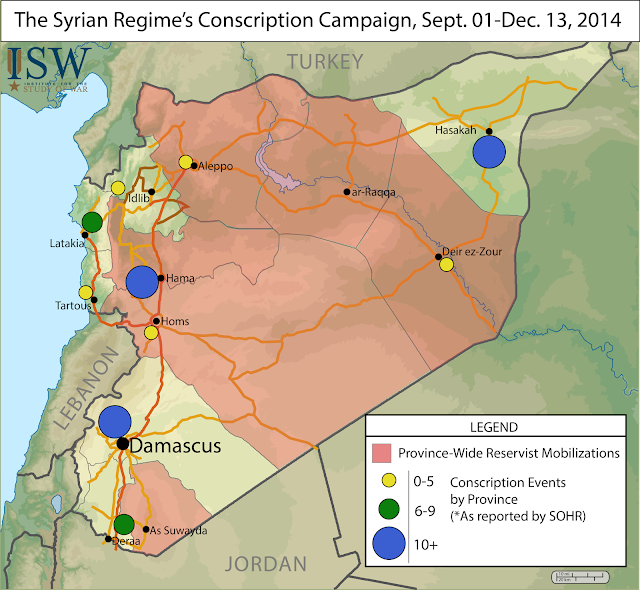 Despite losses, the Syrian Air Force has maintained an impressive cycle of operations. Analysts drawing from opposition sources estimated that the Syrian regime continued to conduct approximately fifty combat sorties per day throughout the country as of December 2014. The sustained nature of this air campaign requires a resilient resupply and logistical system. The Syrian Air Force receives heavy assistance in this task from Russia, which continues to provide pilot training, shipments of spare parts, weapons deliveries, and aircraft upgrade packages for the Syrian Air Force despite the ongoing conflict. This dependence further underscores the precarious challenges facing the Syrian Armed Forces which leave Assad unable to overwhelm the opposition despite his military advantages. The Syrian Air Force possesses limited close air support technical capabilities and thus the majority of fixed wing strikes in Syria are “collective punishment” attacks against opposition-held areas in an attempt to deter and depopulate. Activists on the ground have reported numerous precision airstrikes against markets, schools, hospitals, bakeries, refugee camps, and other distinctively civilian targets. Meanwhile, Syrian Air Force helicopters continue to bombard residential neighborhoods indiscriminately throughout the country with ‘barrel bombs’ dropped from high altitudes in order to avoid anti-aircraft fire. Data from the Violations Documentation Center in Syria indicated that the combination of these aerial attacks accounted for thirty-nine percent of civilian fatalities between August and October 2014. The fixed wing aircraft of the Syrian Air Force also demonstrate reasonable effectiveness in a close air support (CAS) role despite their limitations. Concentrated airstrikes have been used to both support regime offensive operations and blunt opposition advances throughout the country in 2014.124 However, relatively frequent friendly fire incidents have underscored the limits of Syrian Air Force CAS capabilities.125 Regime aircraft also conduct numerous strikes against government positions captured by opposition forces in an attempt to destroy captured military equipment. For example, the Syrian Air Force bombarded Storage Base 559 northeast of Damascus after opposition fighters captured the position in March 2014, destroying 70 out of the 105 tanks stored on site. Similarly, warplanes targeted the Wadi al- Deif military base in Idlib Province with at least forty-two strikes after its capture by rebel forces in December 2014. The regime also capitalized upon its previous barrel bomb tactic to maximize its destructive power against rebel strongholds in 2014. Regime specialists retooled barrel bomb designs in the first half of 2014 to feature stabilizing fins and impact fuses which greatly improved the chances of an effective blast. Later, the regime also incorporated chlorine gas cylinders into their improvised aerial weapons. The alleged injury of an ‘Iranian officer’ during a blast at a barrel bomb factory on November 28, 2014 in the Hama Military Airport suggests that this redesign may have been aided by Iranian technical advisors.130 Previously confining them to Idlib and Aleppo Provinces, the regime expanded the use of barrel bombs throughout Syria in 2014, including Hama, Latakia, Damascus, and Dera’a Provinces. Barrel bombs have even been utilized in the remote northeastern province of Hasaka in early 2015. However, the Assad regime primarily took advantage of coalition airstrikes in eastern Syria to redirect additional air assets against opposition forces throughout the western half of the country. One anonymous U.S. official commented that “It would be silly for them not to take advantage of the U.S. doing airstrikes…essentially, we’ve allowed them to perform an economy of force.” Analysis of regime airstrikes reported by SOHR between August and October 2014 confirms a dramatic shift of Syrian Air Force combat sorties from ar- Raqqa and Deir ez-Zour Provinces in favor of the opposition strongholds of Idlib, Dera’a, and Hama Provinces. These strikes have hindered rebel operations against the regime and exacted a vast human toll on civilian populations behind the frontlines, sparking further resentment and radicalization which may eventually pose a threat to Western nations perceived as turning a blind eye to regime excesses. Meanwhile, the Assad regime has also continued to utilize chemical weapons against rebel forces despite an ongoing disarmament deal. The Syrian regime agreed to the total destruction of its chemical weapons stockpiles and production facilities on September 14, 2013 and on June 23, 2014, the last shipment of declared chemical weapons departed from Latakia port for disposal. The demolition of twelve declared chemical weapons facilities is ongoing and scheduled for completion by the end of June 2015.145 The Assad regime, however, quickly turned to the use of chlorine, ammonia, and other dual-use industrial chemicals in order to maintain its asymmetric capabilities against the Syrian opposition. Human rights organizations and Organization for the Prohibition of Chemical Weapons (OPCW) investigation teams have found “compelling evidence” that regime forces have deployed chlorine gas “systematically and repeatedly” throughout Syria. An examination of alleged chlorine attacks in late August 2014 found that regime forces employ these chemical weapons in order to set the conditions for ground offensives against opposition strongholds or prevent opposition advances in areas where the regime cannot deploy large amounts of ground forces. On March 6, 2015, the UN Security Council adopted UNSC Resolution 2209 directly condemning the use of chlorine gas as a weapon in Syria and threatening that parties using these chemicals will be held accountable by the United Nations. However, international enforcement measures against such violations remain unclear and three days later regime forces reportedly used chlorine gas against the rebel-held town of Muzayrib in Dera’a Province. The persistent regime use of chemical weapons in flagrant violation of international norms only serves to generate additional civilian casualties and increase the appeal of extremist groups which portray the Syrian Civil War as an existential struggle against the regime. ISIS seized the Tanf border crossing between Iraq and Syria, circled in the map above. 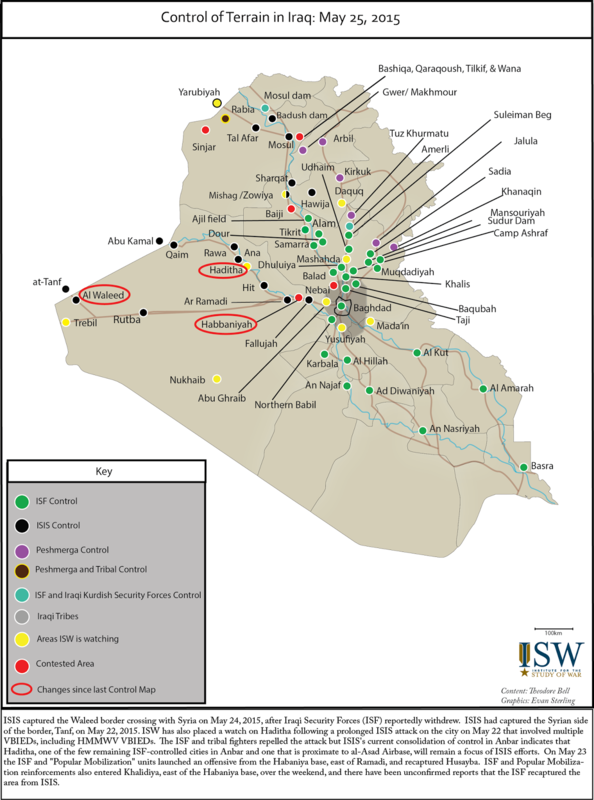 The status of the Walid border crossing on the Iraq side is still unknown and assessed to be contested. 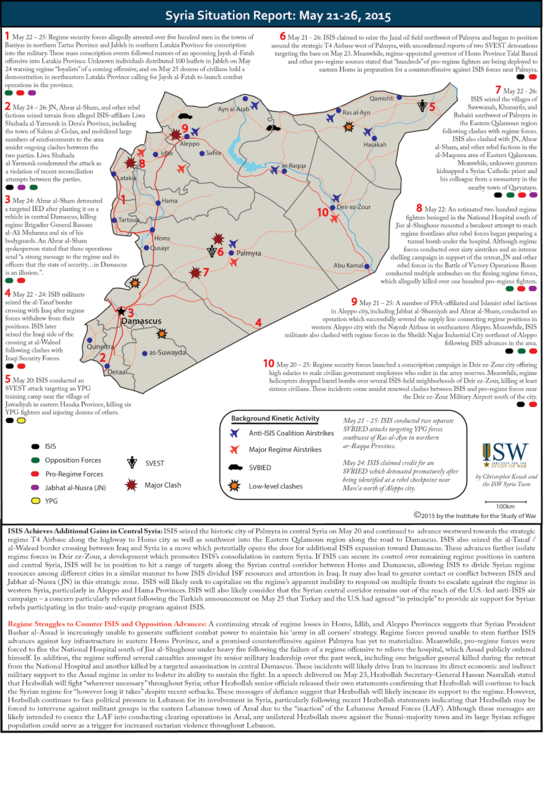 This analysis of the Syrian regime’s strategic objectives is adapted from the ISW report “An Army in All Corners”: Assad’s Campaign Strategy in Syria by ISW Syria Analyst Christopher Kozak published in April 2015. 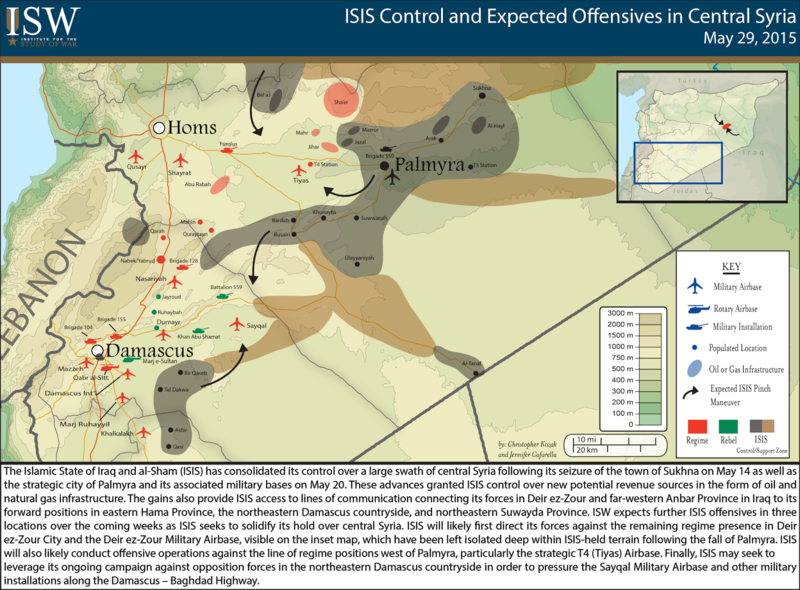 May 21 Update: The recent fall of the strategic city of Palmyra to ISIS highlights the risks faced by Syrian President Bashar al-Assad as he attempts to counterbalance the regime’s increasingly-fraught military position with his desire to maintain an “Army in All Corners” strategy. Palmyra represented a key lynchpin in the system of remote outposts garrisoned by the regime throughout the country as a way of maintaining the appearance of a national presence while reinforcing Assad’s “own legitimacy as the only viable alternative to a failed, jihadist-dominated Syrian state.” The loss of Palmyra thus marks a major blow to the campaign designs of the Assad regime and signals that time may be running out for Assad’s plan to garner international support as the only effective anti-ISIS actor on the ground. The military campaign of the Syrian regime has been primarily driven by Assad’s core objective to preserve his rule in a post-war Syria through a negotiated “political solution.” However, Assad’s efforts to drive the situation on the ground in a favorable direction faced a number of key challenges. 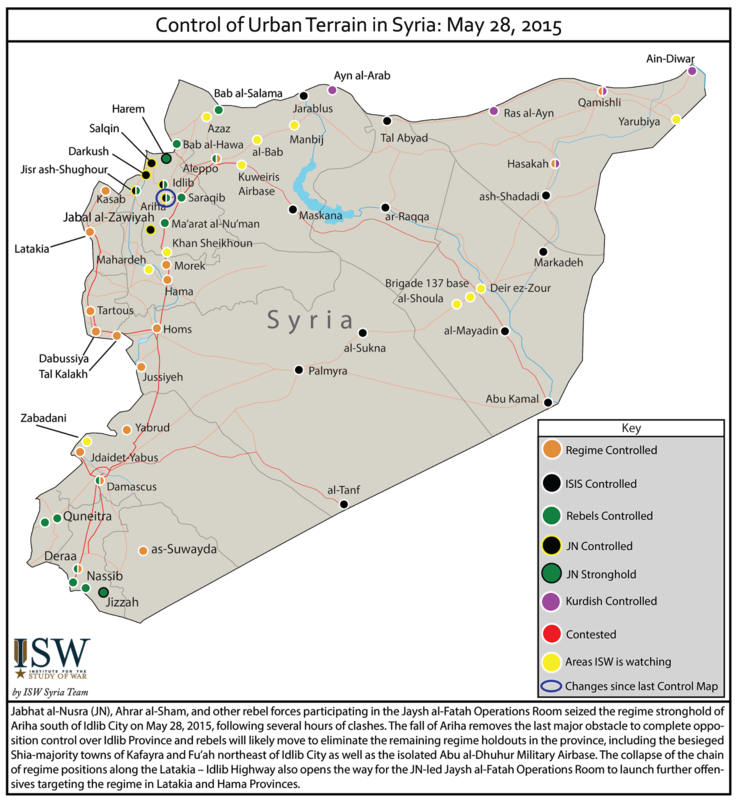 The geographic dispersion of regime positions and the countrywide scope of the Syrian Civil War forced the Assad regime to prioritize among military fronts in 2014, enabling opposition forces to advance in multiple locations including Idlib and Dera’a Provinces. Salafi-jihadist rebel groups also grew in strength and coordination in 2014. The regime faced new challenges on the battlefield as the consolidation of military strength among JN, Ahrar al-Sham, and other Salafi-jihadist factions in Syria throughout 2014 enabled numerous major battlefield victories over the regime in Aleppo, Idlib, and Dera’a Provinces. However, these developments also sparked new opportunities for Assad to align with the international community by fueling the narrative that the Syrian government faces an invasion of ‘terrorists’ that poses a transnational threat. Assad promoted this framing of the conflict in order to reinforce his own political legitimacy as the only viable alternative to a failed, jihadist-dominated Syrian state. Assad likely reasons that by avoiding decisive defeat and preserving his presence throughout the country, the insurgency will eventually be depleted as opposition forces grow increasingly radicalized and alienated from their domestic and international supporters. The Assad regime prioritizes maintaining Syrian Arab Army (SAA) presence throughout Syria in order to frame its claim to a united and contiguous post-war Syrian state. President Assad expressly delineated this policy in his January 2015 interview with Foreign Affairs, stating: “If you look at a military map now, the Syrian army exists in every corner. Not every place; by every corner, I mean north, south, east, west, and between. If you didn't believe in a unified Syria, that Syria can go back to its previous position, you wouldn't send the army there as a government.” The strategy of an “army in all corners” is designed to preclude a partitioned Syria or rump Syrian state from forming. The existence of SAA formations across Syria also provides President Assad with a political narrative as the leader of a sovereign and undivided country. Assad is unable, however, to use his dispersed footprint to establish security throughout the country in the face of an active armed opposition. Assad’s remote outposts incur risk to his campaign. Their strict defensive posture and inability to project force into their surroundings makes them targetable by opposing forces. Limited options for reinforcement and resupply can leave their garrisons isolated and vulnerable in the face of concerted offensives. This risk was brutally demonstrated in July and August 2014 when ISIS militants overran a series of holdout regime military bases in ar-Raqqa and Hasaka Provinces, capturing and executing hundreds of SAA soldiers. Nevertheless, these strongholds also frequently withstand enemy attacks, providing the Assad regime with staying power at little cost. 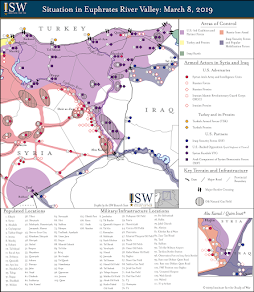 The besieged Wadi al-Deif and al-Hamidiyah military bases in southern Idlib Province, for example, fixed opposition forces for nearly two years before being overrun in a joint Jabhat al-Nusra (JN)–Ahrar al-Sham (HASI) operation in December 2014. Ultimately, this element of regime strategy fails when outposts are isolated and overwhelmed. This trend may accelerate in 2015 amidst increasing coordination between mainly-Islamist opposition forces. The Assad regime also seeks to maintain its control over the Syrian civilian population in order to bolster its image as the only legitimate governance structure in the country. President Assad has repeatedly stated that the most critical battle in Syria is the one for the Syrian people. Assad also detailed this policy in his interview with Foreign Affairs: “Before talking about winning territory, talk about winning the hearts and minds and the support of the Syrian people. That’s what we have won. What’s left is logistical; it’s technical. That is a matter of time.” Experts estimate that the Syrian regime controls between 55 and 72 percent of the Syria’s remaining populace as of January 2015. The Syrian opposition, on the other hand, controls less than a third of the country’s population – affirming President Assad’s boast that “the communities which embraced terrorists have become very small.” Assad did not mention that the remainder of Syria’s population now lies within areas under the regime’s control as a deliberate outcome of Assad’s own punitive depopulation campaigns. On the ground, this rhetoric translates into an extremely lethal form of population-centric counter-insurgency (COIN) in areas under opposition control. The Syrian regime inflicts mass punishment against civilians in opposition areas to force large-scale displacement. Regime ground forces besiege rebel-held neighborhoods and cities, cutting off aid supplies and spurring thousands to flee to regime zones of control in the face of starvation. Civilians in opposition-held zones are also subject to indiscriminate targeting by artillery, airstrikes, and crudely-devised “barrel bombs.” By March 2015, these barbaric methods had killed more than 220,000 Syrians and displaced over 11.5 million civilians, mainly from opposition-held terrain. In sum, the concentration of the Syrian population in territory controlled by Assad comes in large part as the result of a humanitarian crisis generated by the regime itself. This disparity offers the Assad regime several distinct advantages over rebel forces. Control over the majority of the surviving Syrian population provides opportunity to tap manpower reserves to aid the regime’s fight and also restricts civilians from joining the Syrian opposition. The regime also benefits from enduring economic activity that generally no longer exists in rebel-held areas. Continuous efforts to depopulate opposition-held zones and consolidate civilians into regime-held areas feed into the narrative that “the majority of the Syrian people…support their president.” This argument manipulates Syria’s recent history and portrays the staying power of Bashar al-Assad and his government favorably in political negotiations. Acceptance of this statement at face value risks legitimizing mass violence against civilians as a tool which could be used in other conflicts. The regime uses the appearance of enduring military and social control in Syria to bolster domestic and international legitimacy in preparation to discuss political settlement. Assad regularly uses “jihadism” in Syria as an argument to curry international favor. In an interview conducted on November 28, 2014, President Assad criticized U.S.-led coalition airstrikes against ISIS in Syria by insisting that “terrorism cannot be destroyed from the air, and you cannot achieve results on the ground without land forces.” Regime officials regularly promote the SAA as the only realistic force with the “experience in the field” to counter terrorist groups operating in Syria, such as JN or ISIS Assad reaffirmed in a later interview on January 20, 2015 that this partner “definitely…has to be Syrian troops.” In some cases, Assad backs his claims with force. The Syrian Air Force, for example, conducted several sorties against the ISIS “capital” of ar-Raqqa in a move clearly designed to align with the global anti-terrorism campaign following the launch of anti-ISIS coalition air raids in Syria on September 22, 2014. The regime also attempts to maintain vestiges of democratic processes in order to underscore the claims of legitimacy made by the Syrian government. The 2014 Syrian presidential elections were widely held by regime officials as an expression of mass popular support for the Syrian government despite pervasive indications of fraud and voter suppression. The Assad regime retains a “tolerated” internal opposition group, the National Coordination Committee for Democratic Change (NCCDC), which provides a façade of political pluralism. On January 26, 2015, regime officials even traveled to Moscow to hold talks with NCCDC members. The NCCDC possesses no representation from either the exiled Syrian National Coalition (SNC) opposition government or the armed Syrian opposition on the ground. The delegations unsurprisingly agreed on most of the key building blocks of the regime’s political strategy, including the maintenance of Syrian unity and sovereignty, the importance of combating terrorism, and the necessity of a political settlement. The Assad regime’s political goals generated a military strategy which remained relatively consistent throughout 2014 and into 2015 despite shifts in battlefield dynamics which forced the regime to adapt to new circumstances. These disruptions, including unexpected rebel successes in southern Syria and the withdrawal of thousands of allied Iraqi Shi’a fighters from Damascus following the fall of Mosul in June 2014, have often sparked key inflection points in the campaign for Syria. These shifts forced the regime to adapt its capabilities frequently, but they have rarely altered the ways in which regime forces have attempted to carry out the war. This resiliency indicates that the Assad regime possesses a coherent military strategy that has been robust enough to absorb the pressures of unanticipated events. Assad likely believes that upholding this clear plan of action while avoiding unnecessary risks on the battlefield will allow him to win the war for Syria without an outright military victory.